The main thrust of my Night Lords collection is going to be Heresy-era Marines. Why, then, would I start monkeying around with a bunch of Cultists? Two reasons - first, the army will also be used for 40K, Kill Team and Necromunda (where, thanks to an excellent White Dwarf article, you can now field Chaos Cultists). Cultists play a big part in these systems and are good value as disposable troops who can sit on an objective or bog down opponents. Second, the Night Lords novels introduce some fantastic Legion-serf characters who are great inspiration for Cultist conversions. So let me introduce to you (from left to right) Some Dude, Septumus, Octavia, Hound and Maruc. The novels' characters served more as inspiration so there are little nods to them here and there. Like Hound's diminutive stature and his shotgun and Septimus' bionic eye. Some Dude wears a Drukhari Scourge helmet which harks back to the Bleeding Eyes Raptor units in the novels, who are portrayed as very bird-like with some disgusting avian habits. The stand out model for me is Octavia the Navigatrix. She will represent the Witch who supports the Chaos Cult gang in games of Necromunda. I eventually settled on a weird diving-bell helmet rather than trying to sculpt on her third eye (or the bandanna she uses to conceal it). I also added her pony tail of black hair, which in the novels gets increasingly more 'ratty' as the haughty noble spends time in the service of the Legion. Below are some WIP shots of her. Given my Marines will be dull metallic blue, I needed a matt solution for the Cultists' dark robes. The black highlighted with blue gives a real 'midnight' feel. I might roll this out elsewhere in the collection too. 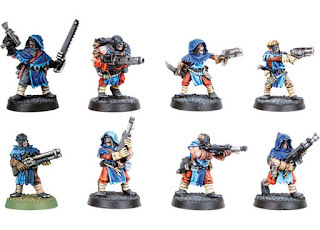 Amusingly, the combo of blue-black and red makes these guys feel a bit like old-skool Cawdor gangers. Next up, more Cultists. Or some Heresy Marines. Or some Spawn. Depending on what I finish first. Ask yourself: Have I got the budget for demons? When is it best to put your demons on screen? When you've got a budget to do them properly, that's when. M.R. James' tale Casting the Runes has an enduring appeal as one of his best tales, and rightly so. Published in 1911 it has all the classic elements of British gothic horror - an eccentric and malevolent antagonist living in an old abbey, runic death cards, unexplained events all topped-off by a rather nasty bit of supernatural payback. It has been adapted several times for the screen, the best of which is undoubtedly the 1957 film Night of the Demon directed by Jacques Tourneur. Tenebrous Kate has just posted a brilliant critical appraisal of this cinematic masterpiece. So I'm going to talk about it's slightly more rubbish cousin. 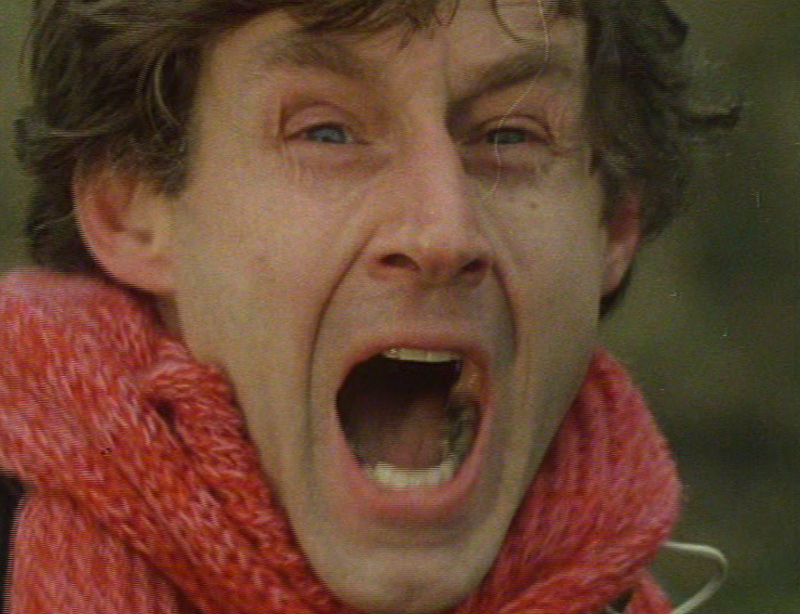 The BBC worked its way through many of James' tales in its excellent Ghost Story for Christmas series which ran throughout the 1970s (and was more recently resurrected). 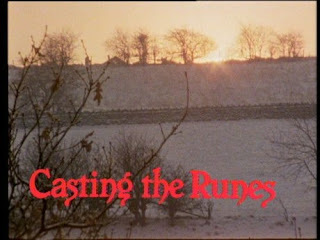 Perhaps because of the success of Demon they decided not to adapt Runes. 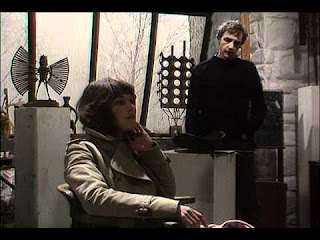 Thus it was the rival channel ITV that brought the tale to the small screens in 1979 with the help of Lawrence Gordon Clark (who had worked extensively on the BBC's series). And he proved the BBC's caution justified. Clark's version is laudably progressive but, ultimately, a hot mess of a show. He transposes the action to a modern-day big city and reenvisions the protagonist as a female journalist. It starts strong with beaucolic shots of the British rural landscape in snow and the first killing is quite horrible. He works in a bit of giant-insect horror to good effect. This harks back to a scene in the short story where a group of children are terrified by the antagonist, but also references some of James' best tales which put giant spiders or sawflies to good use. However, the show loses its momentum and falls apart in the second half thanks to poor pacing and the heroine's agency diminishing. The opportunities James' interesting antagonist Karswell provides are largely wasted (in stark contrast to Niall MacGinnis' amazing turn in the 1957 film). My main issue, though, is the rather unpalatable ending which implies that several hundred innocents die as part of the revenge on Karswell. This leaves an unpleasant taste and makes you kind of wish the giant spider had had its way with the heroine in Act 1. All told, pretty much the only way Clark's version triumphs over Tourneur's is with its depiction of the titular demon. Clark keeps the beast off camera for the most part, and the few instances we see it are so well composed or shot that the thing is really quite unsettling. By contrast, a rather wonky rubber puppet is universally agreed to be the biggest let down in Tourneur's otherwise impeccable film. It's a lesson put to excellent use later in movies like Alien, Jaws and The Exorcist. Welcome to another Night Lords shindig! 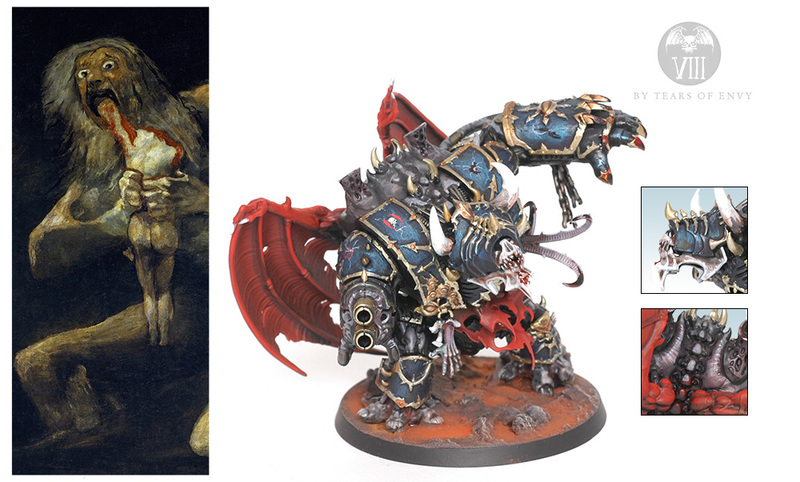 Tonight's special guest is a Hellbrute from the Dark Vengeance boxed set. This guy was another colour test of sorts as I wanted to see how best to treat large areas of (mutated) flesh. He was also an experiment in trying to paint faster. In fact, he was pained from head to toe (and yes, he does have toes if you look carefully) in one weekend. I tried not to get bogged down in details. Although a lot of the flesh highlighting is impressionistic I'm pretty pleased with the result. Originally I had intended not to convert him, but that pledge to myself was swiftly forgotten when I discovered some Tyranid wings in my bits box. And a dread abyssal head. And a few other undead bits. These additions give him a bat-like appearance which ties him more closely to the Night Lords. Truth be told, I feel the head is a bit too big (and makes his weapons feel small), but the overall result is quite pleasing.